Eddington is Cambridge’s newest neighbourhood with something for everyone. a state-of-the-art community centre and performing arts venue, and more. Eddington is a whole new area of Cambridge, designed for twenty-first century sustainable living. If you are a resident and want to find out more about your home, log into the Portal. You can explore the community facilities and find out more about what Eddington offers at www.eddington-cambridge.co.uk. 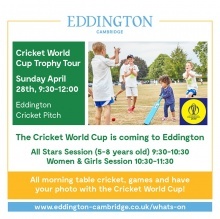 The Cricket World Cup will be visiting Eddington as part of a worldwide tour. Very friendly ‘get into running’ session for complete beginners, every Thursday from Eddington Sainsbury’s.